Xiangzhou, located in the center of Guangxi, is known for the local hot spring which has centuries of history, and is being referred to as “the Best Hot Spring in South Central China”. 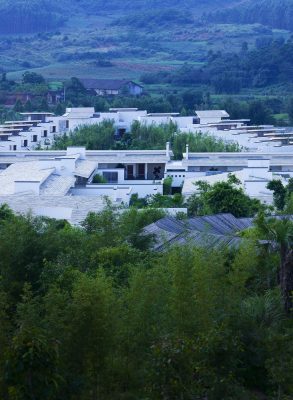 Silkgarden Resort and Spa, is situated at this pastoral scene, which is described with the verse “Fairy water falls on earth, and beautiful scenery is looming in the mist. Out of the client’s trust, the designer is invited to take full control of the whole project from overall planning, to architecture design, landscape design and interior design. In resort planning and design, garden style architecture is a common construction technique used. 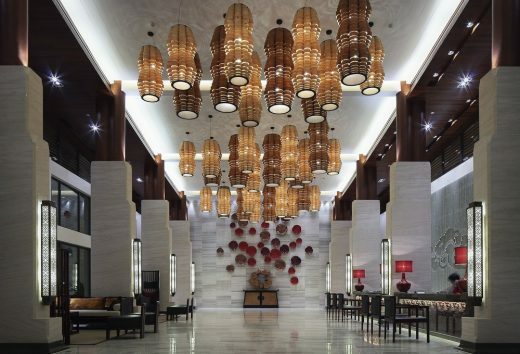 The major consideration for the designer is how to coordinate rea-sonably the various complicated functions of the hotel and put them into an integrated whole through identifying their common feature. The rapid development of economy speed up the complexity of the city, which makes people become increasingly long to relax themselves in the nature. But the reality is the cold and so called modern architecture or foreign style architecture is a far cry from people’s traditional complex to “find the peace of mind by indulging themselves in the beauty of mountains and waters”. 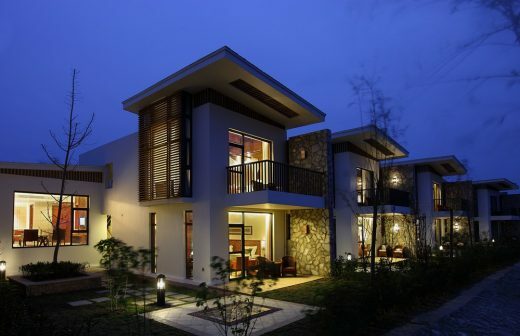 So the design looks at how to make up the loss of traditional culture and to redefine the resort. 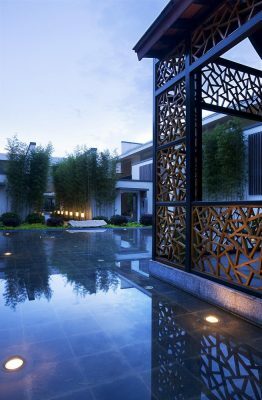 The designer divides the main functions of the hotel into guest room area, dining & meeting center and spa center ultimately, and redefines them with Chinese traditional courtyard relationship. 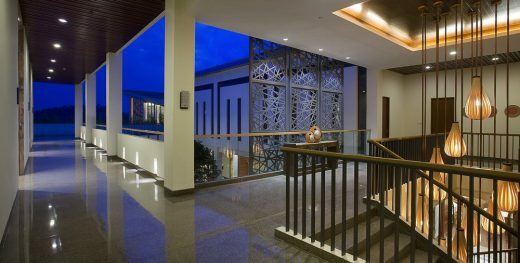 At the guest room area, guests could enter the three courtyards enclosed by ten two-story buildings through the front yard surrounded by the lobby and auxiliary space. 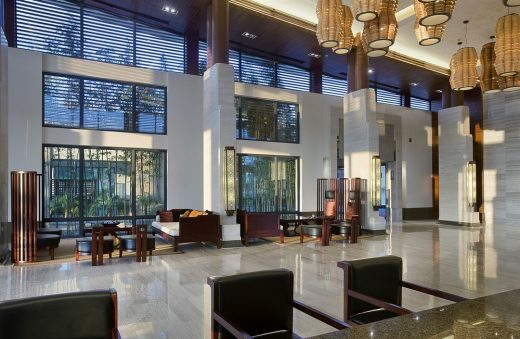 They form the main structure of guestrooms, and the courtyards become the main nodes that connect all the spaces. 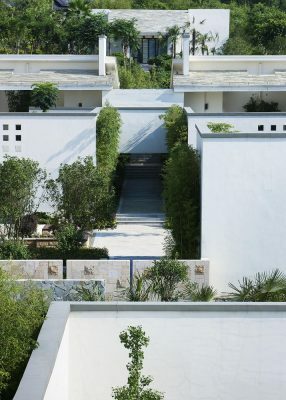 After fully consideration of guests’ routes of activity and the service process and radius, the three courtyards are distributed in “triangle” shape. In traditional courtyard, all functional spaces are closed to external envi-ronment and open to the courtyard itself. However, base on the modern way of life and the management pattern of the hotel, the designer takes a completely different approach: the courtyards are closed to all guest rooms and open to the exterior envi-ronment. This ensures the privacy of the guests while at the same time creates ex-cellent outdoor views. 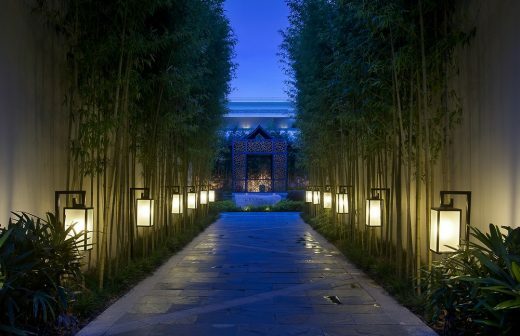 Before entering each building from the courtyards, guests need to get through the small yards of each building and then walk through the bamboo grove in front of each guest room in the corridor. In this way, an imagery where there are courtyards in the courtyard, and there are scenes in front of the house is created. Different designs of different spaces allow the guests to experience the process of entering into their private space while sensing the changes of spaces, and their mind is thus fully relaxed. The technique of courtyard is also used in dining and meeting center and hot spring bath center. 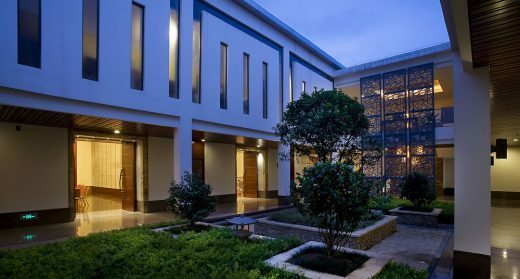 The banquet hall, dining hall and conference room are unfolded naturally around a central courtyard. The use of courtyard makes the space of the hot spring bath center open or close to outside different environments properly. Because of the courtyard, even in the most private changing room and bathroom, guests feel like being in the nature, and obtain enough natural lighting. 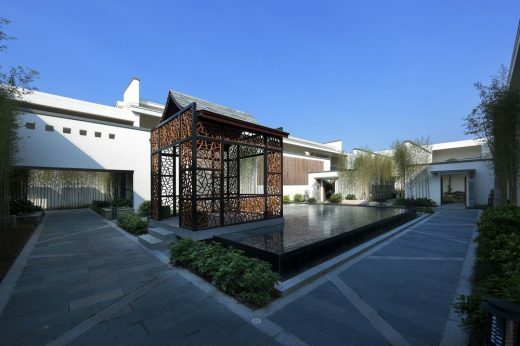 The rich level of the courtyard, on the other hand, simplifies the facade of the build-ing, which is similar to the traditional Chinese ink painting where black, white and grey are chosen naturally. The designer avoids complex shapes and facade; white is taken as background, and locally produced cinerous stone is used to form the basic outline of the building, and the timber used in some parts increases the friendly feeling of the space. Here, the artistic conception of traditional residence “white walls and grey tiles” is reborn in a modern and enjoyable way. Local natural sceneries “cloud”, “amazing trees” and “beautiful water” are extracted by the designer in an abstract way, and being integrated into interior and exterior spaces of the hotel by using different techniques. 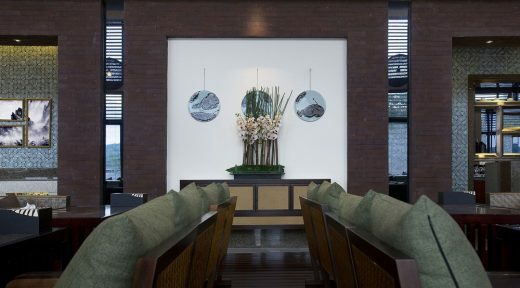 This makes the interior space cor-responds finely with the exterior space and creates a “Yin Yang” harmony between them. 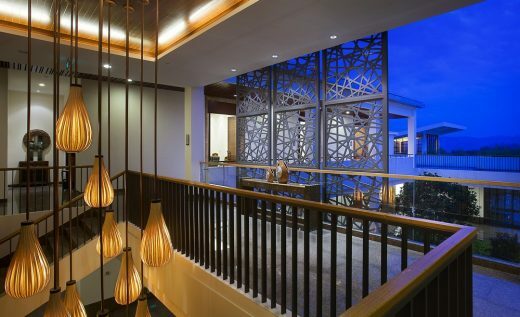 “Cloud”, “tree” and “water” are embodied in the design of every courtyard and become the design theme of the interior space of guest room, dining area and spa center. 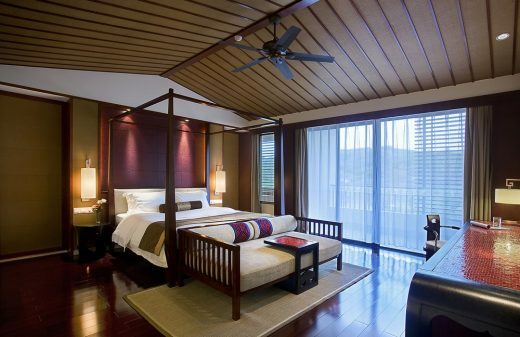 Based on these elements, the design of standard guest rooms makes chang-es from consistency through dealing with colors and details, giving the guests differ-ent feelings. 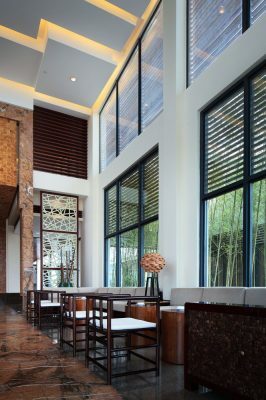 “Zhuang brocade” pattern which derived from local traditional hand-woven fabrics are reflected in every part of the space such as walls, partitions, furni-ture, fabrics etc. in various ways. 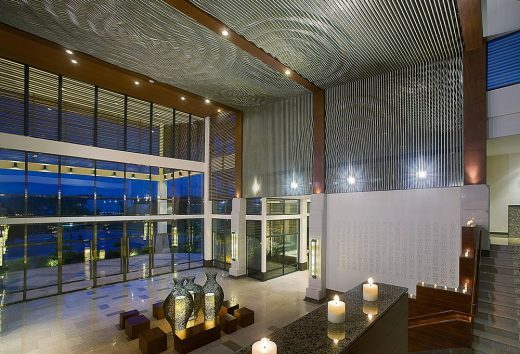 Together with the massive application of local ma-terials and construction methods, it shows the designer’s respect to the local tradi-tional culture in a moderate and exquisite way; and meanwhile it offers the guests a native, comfortable and natural leisure experience and natural taste. Chinese traditional culture becomes weaker and weaker with the impact of modern civilization, so what could be done to keep it from becoming “Moon in the water” and “flower in the mirror”? The designer hopes to find a new way through using modern techniques while keeping the traditional essence such as quiet, delicate, profound and Zen sense. By doing this, a new inheritance way may then be found.